Tonsillectomy is a surgical procedure to remove the tonsils. The tonsils are part of the lymphatic system, which is responsible for fighting infection. Physicians are not in complete agreement on the number of sore throats that necessitate a tonsillectomy. Most would agree that four cases of strep throat in any one year; six or more episodes of tonsillitis in one year; or five or more episodes of tonsillitis per year for two years indicate that the tonsils should be removed. each year in the United States. Approximately 70% of surgical candidates are under age 18. A tonsillectomy is usually performed under general anesthesia, although adults may occasionally receive a local anesthetic. The surgeon depresses the tongue in order to see the throat, and removes the tonsils with an instrument resembling a scoop. Alternate methods for removing tonsils are being investigated, including lasers and other electronic devices. Tonsillectomy procedures are not performed as frequently today as they once were. One reason for a more conservative approach is the risk involved when a person is put under general anesthesia. Bleeding disorders must be adequately controlled prior to surgery. Acute tonsillitis should be successfully treated prior to surgery. Treatment may postpone the surgery three to four weeks. Persons are turned on their side after the operation to prevent the possibility of blood being drawn into the lungs (aspirated). Vital signs are monitored. Patients can drink water and other non-irritating liquids when they are fully awake. Adults are usually warned to expect a very sore throat and some bleeding after the operation. They are given antibiotics to prevent infection, and some receive pain-relieving medications. For at least the first 24 hours, individuals are instructed to drink fluids and eat soft, pureed foods. People are usually sent home the day of surgery. They are given instructions to call their surgeon if there is bleeding or earache, or fever that lasts longer than three days. They are told to expect a white scab to form in the throat between five and 10 days after surgery. There is a chance that children with previously normal speech will develop a nasal-sounding voice. In addition, children younger than five years may be emotionally upset by the hospital experience. There are risks associated with any surgical procedure, including post-operative infection and bleeding. Normal results include the correction of the condition for which the surgery was performed. Morbidity other than minor post-surgical infection is uncommon. About one in every 15,000 tonsillectomies ends in death, either from the anesthesia or bleeding five to seven days after the operation. There are no alternatives to surgical removal of the tonsils. Drug therapy may be used for recurrent infections involving the tonsils. Bland, K.I., W.G. Cioffi, M.G. Sarr. Practice of General Surgery. Philadelphia: Saunders, 2001. Braunwald, E., D.L. Longo, J.L. Jameson. Harrison's Principles of Internal Medicine, 15th ed. New York: McGraw-Hill, 2001. Goldman, L. & J.C. Bennett. Cecil Textbook of Medicine, 21st ed. Philadelphia: Saunders, 1999. Schwartz, S.I., J.E. Fischer, F.C. Spencer, G.T. Shires, J.M. Daly. Principles of Surgery, 7th ed. New York: McGraw Hill, 1998. Townsend, C., K.L. Mattox, R.D. Beauchamp, B.M. Evers, D.C. Sabiston. Sabiston's Review of Surgery, 3rd ed. Philadelphia: Saunders, 2001. Remacle, M., J. Keghian, G. Lawson, J. Jamart. "Carbon-dioxide Laser-assisted Tonsil Ablation for Adults with Chronic Tonsillitis: A 6-month Follow-up Study." European Archives of Otorhinolaryngology 260, no.4 (2003): 243-6. Silveira, H., J.S. Soares, H.A. Lima. "Tonsillectomy: Cold Dissection Versus Bipolar Electrodissection." International Journal of Pediatric Otorhinolaryngology 67, no.4 (2003): 345-51. Werle, A.H., P.J. Nicklaus, D.J. Kirse, D.E. Bruegger. "A Retrospective Study of Tonsillectomy in the Under 2-Year-Old Child: Indications, Perioperative Management, and Complications." International Journal of Pediatric Otorhinolaryngology 67, no.5 (2003): 453-60. Yaremchuk, K. "Tonsillectomy by Plasma-Mediated Ablation." Archives of Otolaryngology Head and Neck Surgery 129, no.4 (2003): 498-9. American College of Surgeons. 633 North St. Clair Street, Chicago, IL 60611-32311. (312) 202-5000. Fax: (312) 202-5001. E-mail: http://postmaster@facs.org. http://www.facs.org . American Academy of Otolaryngology-Head and Neck Surgery. One Prince St., Alexandria, VA 22314-3357. (703) 836-4444. http://www.entnet.org/index2.cfm . American Osteopathic College of Otolaryngology-Head and Neck Surgery. 405 W. Grand Avenue, Dayton, OH 45405. (937) 222-8820 or (800) 455-9404, fax (937) 222-8840. Email: http://info@aocoohns.org. Columbia University School of Medicine. [cited May 5, 2003] http://www.entcolumbia.org/t-aproc.htm . Eastern Virginia Medical School. [cited May 5, 2003] http://www.evmsent.org/ped_ops/tonsillectomy.html . National Library of Medicine. [cited May 5, 2003] http://www.nlm.nih.gov/medlineplus/ency/article/003013.htm . University of California-San Diego. [cited May 5, 2003] http://www-surgery.ucsd.edu/ent/PatientInfo/instructions_tonsillectomy.html . University of Florida. [cited May 5, 2003] http://www.ent.health.ufl.edu/patient%20info/T&A.htm . L. Fleming Fallon, Jr., MD, Dr.PH. A tonsillectomy is performed in an outpatient facility associated with a hospital by a general surgeon or otolaryngologist (physician who specializes in treating disorders of the ear, nose, and throat). What will be the resulting functional status of the body after the operation? Is the surgeon board certified in head and neck surgery? How many tonsillectomy procedures has the surgeon performed? Has the surgeon operated on children? I would like to ask about the different between intracapsular tonsillectomy and ekstratonsillectomy, could you give me more information about both tehnique. Also it that any advantage to restore the tonsilar capsule? Does this procedure effect your voice?My 15 year old son is concerned with this could you please email me back and let me know. is there any risk or compications for adults (61 years old), to have tonsillectomy? before the operation do you need to shave youself or does it matter?? Can this be caused easily by a tonsillectomy or is it a rare occurence and why it is so rare? My husband has alot of the symptoms(enlarge tonsils, sore throats, not sleeping at night,etc). He is a heart patient with a pacemaker defibrillator and his age is 47. I am concern because he is a heart patient. He has already gotten clearance from his heart doctor. Do you often know if heart patients have this procedure? What advice can you give? t express what hurts, but I i can understand that it hurts? I'm afraid to do the operation, Is there any other way?? IN adult surgeries does the voice get altered after the surgery? My voice is that of a mentally challanged person now. And I want to know if this is normal? Hi, does this procedure effect your voice? Also is it ok for a 19 year old to go clubbing 3 weeks after operation? Please email back with an answer. My son is almost one. His pediatric things that it would be best for the ENT to take his tonsils and andoids out when he has tubes placed in his ears. We have a appointment with the ENT on the 19 for a evaluation, but I just want to learn more about what to expect. Im really worried. My 5 yr old daughter had hers out in JAn, and it was no fun for any of us, but because my son is so young, I dont know if things are going to be similar or completely different. Will he need to stay in the hospital? Hes got asthma, will that effect the surgery or recovery? He had surgery when he was 5 months from a lap in his throat that would close. He nurses still, but Im worried if he wont drink after. My daughter is 6 yrs old. she had her tonsils taken out today. can we give cough meds along with her pain meds to help with the cough? and I was wondering if they bleed on the 2 week when you got down with the surgry. My daughter is 21 months old, and is scheduled to have a adenotonsillecomy. Is there any side effects I should know of if this procedure is done at such a young age? I am a 40 year old female 4 days post op. The worst part of my surgery has been my body feeling like I've been ran over by a truck. My throat has been a little sore, but nothing worse than expected. My jaw and eyes hurt towards evening and my legs, arms, neck and back feel like I've been in a fight. Is there anything that can be done about the soreness?? This is my 8th day after a tonsillectomy, I'm still having severe headach, throat, neck and ears pain, is that normal.my tongue and the roof of my mouth feels swollen. Is it the meds that make me so dizzy? Explain why a tonsillectomy in a child is less likely to involve complications than same procedure for an adult. Hi, my husband is about to have a tonsillectomy in 2 days, he is overly worried and is concerned about leaving his three children behind. Is there any recorded deaths during procedure or is all recorded deaths post op? He also has asthma and has a hard time breathing lately and takes his ventalin when needed. Will taking ventalin post op affect the mouth/throat? He is also waiting for some teeth to be removed, how long after surgery do you recommend for him to wait? Iam an online student and my instructor gave us an assignment about tonsillectomy, I was just wondering why is it in a child less likely to involve complications than the same in an adult ? my 4yr old child undergo tonsillectomy 10 days ago, and she is suffering from earache. Is it natural after the surgery? How long will it last to come back to her normal condition? is the tonsillitis lead to prolongation of pt and aptt and what is the causes of this prolongation. my 4 and 1/2 year old daughter has got the tonsillitis. during the last three months she suffered twice the infection and the doctors prescribed Zinnet and Augmentin antibiotic. I am afraid what is next. I do not want to go for surgery. is there any other way or any homeopathy or ayurvedic treatment available? Please do reply. I knew of a 21 year old individual whose artery was cut during the procedure which produced severe bleeding after the scab fell off. He almost bled to death---how common is this occurance? i am 2o years old and have been getting tonsilitis almot 6 times a year. i finally had them removed the 10th August 2011 and i am in so much pain now, there is no bleeding but i have such chronic ear ache it feels like my ear drums burst. is this normal, becuase it is worse then the pain in my throat. What are different complications or risk between a Pediatric Tonsillectomy vs. Adult Tonsillectomy ?. Are the risk greater for Adults and what types of complications can result from the surgery? I need this answered ASAP please. hey my son is 2 and 3moths of age, he had tonsillectomy , adonalds and gromitt done on the 16th of sept 2011 , 11th day today and he is not speaking any more he has a nasal sounding, i have tryed verything i can and he has resued to say a word i am very worried about this > should i contact the hospital were he had this done pls advise me becuse am going out of my head. sir, i am 27 and was operated by qualified doctor 7 years back, for removal of tonsils. Since last seven years i didn't face any problem but since last few days i am facing a lot of problems. I am not able to swallow my food, have sleepless nightx due to sore ache. Please suggest. My 19months old daughter had tonsiilectomy on the 18th of November 2011. After the operation she stopped eating and drinking. She was kept in the hospital for 4 days. Everyday she is drinking only 250/300ml water, juice. She used to be bottle fed and used to drink 500ml milk everyday but after the operation she is not touching the bottle at all.Though she is still active. I am giving her some pain relieves madicine and atibiotics which is given by doctor. Do you think She will be alright? or I've to take her to the hospital again. Please suggest. Please Explain Why A Tonsillectomy In A Child Is Lee Likely To Ivolve Complications Than The Same Procedure For An Adult. My Nephew had his tonsils taken out a week ago.. My sister is planning on going to the snow for new years... I told her it was to early to take him out.. I told her to be careful because he could get an infection.. Am I over reacting? is it possable for tonsilectomy to'be done twice within 12 months? I was operated on for tonsilitis 5 months ago but now i am still feel the same symtoms i was feelling before the operation. Please if this is normal or if the tonsilitis is back again. I would like to ask the same question Janice asked; #17. could you explain to me why a tonsillectomy in a child is less likely to involve complications than the same procedure for an adult. is too slow, but my very concern is that, in a few week is my flight going to Qatar and i need to recover asap for my medical unless i am sending back. what will i do? Would like to know the difference in complications from child vs adult. Which is the worst, and why? i'm about to have tonsillectomy in the end of this month and this blog makes me really scare. is there any postive cmments regarding the procedure? any good experience? hi, I have a tonsils problem.. I had acute fullotis that white dots on tonsils, but that is now recovered with anti biotics but still I feel my tonsils are hard and have a little pain in it. and along with it I feel fever and body pain, this is happening for last 2 months. ENT specialist adviced to cut off the Tonsils. So all I need to know is if I cut my tonsils off. would I face any complications in near future?? Hi, my son is only 1 and half yr old and he have difficulty of breathing during asleep because of his kissing tonsils, could it be possible to get smaller as he age? Or could it be possible to be removed at his age.? I am a status post tonsillectomy patient.i was operated last july 25,i didn't feel any unusual signs and symptoms for 4days.but now,i am experiencing and suffering from ear pain and difficulty in speaking.what would i take?is it normal?and how about my voice? 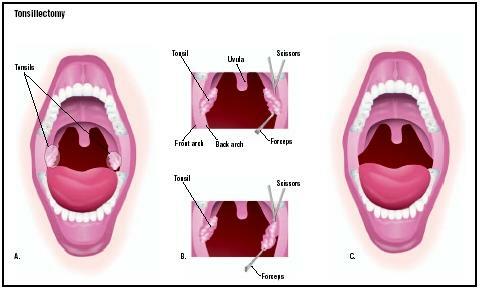 What are the tonsillectomy complications for adults? What are the tonsillectomy complications for a child? I'm 26 years old and I'm going to be getting my tonsils taken out by laser. I just want to know what to expect. Will it effect my voice? And if so...how? What I can eat, how long is my recovery going to be? Will I be able to smoke? And the best things to do to possibly speed up the recovery. I haven't talked to my doctor about this yet...I wanted to investigate this a little more before setting up an appointment. And the reason I am getting my tonsils taken out is because my tonsils are huge and it's difficult to swallow and breathe at night. Why is a tonsillectomy in a child less likely to involve complications than the same procedure for an adult? Afte 4 month my tonsillectomy surgery again I am facing throat infection and throat seem to feel tight when I swallow yet. sometimes I am feeling eching and ear pain. Hi. Im 26 yrs old and I was planning to remove my tonsils because im suffering to this since i was a child. But my parents did not agreed to the doctors that time to remove it. I have a big tonsils, i snore when i sleep, i always suffer in sore throat, something im having diffulty in breathing. My heart ache sometimes. What would be the effect if i undergo that operation? And what is the difference effect to a child age 6yrs old and to the adult 26 if we undergo this operation. Because im thinking also that my son got the same problem as mine. I hope you can give me a answer. Ill be waiting. Hi. I am jaya. I am 25yr old. I am undergoing tonsillectomy on coming Wednesday. I am very concern about general anesthesia . Is their any risk of anesthesia like brain damage or cardiac arrest . Is there any chance of bleeding after tonsillectomy..?will there too much pain after surgery? My tonsils are now not swollen and not paining.. I am undergoing tonsillectomy because I am getting pus from my tonsils even it's not cure by antibiotics..so doctor suggested me to remove tonsils..